Cafe Rio is a super popular Mexican fast food restaurant based of out Utah. It's like the Chipotle of the west. Anyway, up until last summer all the locations were out West until one came to Maryland... and then to Virginia! It's a drive - about a half hour, but I'm out that way a lot for the Doctor with the kids or doing sessions out at the Battlefields. Always great excuses to stop in for a salad! I mean, the food is great, but it's really more about that little piece of Utah that I love. About half the pins that make up Pinterest are for knock off versions of Cafe Rio's pork barbacoa meat and their creamy tomatillo house dressing. Seriously, the possibilities are endless and crazy overwhelming. So, this post is about the recipes I chose, that I liked, and therefore will continue to use. No more searching, this is it! I put my roast (a big one for only $3! Thanks ALDI!) into the crockpot and set my crockpot to high. Just the roast, nothing else. I let it cook for about half the day. Around 2PM I added the rest of the ingredients and shredded the pork. I got a little worried because every time I kept checking it, it just seemed to soupy... But, it all worked out and reduced in the end without needing to drain anything! It was DELISH. Now, if you've never had Cafe Rio, please know this is a very sweet recipe, hence the soda and sugar. If you've never had it before, or you're expecting Chipotle's dry pork, you're in for a surprise. Put it all in a food processor or blender, and chill until it's ready to serve. It'll thicken over time. It's that easy! I use a rice maker, so I just made rice per my machine's directions. I added the butter to the water and let everything cook. Once it was done, I added the juice and cilantro. My friend Rebecca's recipe called for "lime zest", but I'm fancy and use those little plastic limes to get my juice, so zest I had not. First they heat a tortilla with cheese as your base. Next, they add the cilantro lime rice. Top that with your yummy meat. The best part about making it at home is you can add as much meat as you want! Next, top it with romaine or leafy green lettuce. Iceberg is not welcome here. Top that with guacamole (homemade is the way to go) and sour cream, if that's your thing. Tortilla strips come next (I tried so hard to break my chips into strips, but failed) with a topping of parmesean cheese. 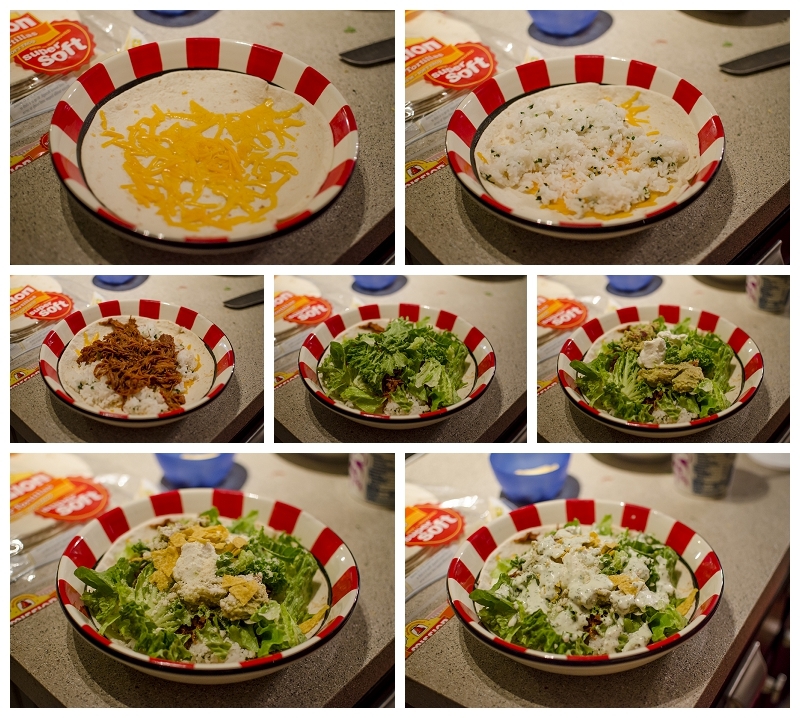 Add your chilled dressing and VOILA - the Cafe Rio salad knock off is born. Now, you can add pico de gallo or beans, but I usually leave those off my salads. Overall, it was delicious. The flavors were just like Cafe Rio. Is it exact? Of course not. If it were the same, they'd be out of business! People keep trying to perfect it (again, have you seen Pinterest?) but these recipes worked great for me. I will definitely do it again - especially when I'm spending almost $9 a pop on salads at the restaurant! You can get the tortilla strips in the salad dressing aisle. Love those things.